Is your property and its contents fully protected? Standard homeowners, condo or renters insurance does NOT cover flood exposure. It's critical to be insured from floods associated with hurricanes, tropical storms, heavy rains or rising tidal water. A lender can require flood insurance, even if it is not federally required. Congress created the National Flood Insurance Program (NFIP) in 1968 to assist in providing a way for property owners to financially protect themselves. The NFIP offers flood insurance to homeowners, renters, and business owners if their community participates in the NFIP program. These communities have agreed to adopt and enforce ordinances that meet or exceed FEMA requirements to reduce the risk of flooding. The National Flood Insurance Program as a general and temporary condition of partial or complete inundation of two or more acres of normally dry land area or two or more properties (at least one of which is your property) from: overflow of inland waters, unusual and rapid accumulation or runoff of surface waters from ANY SOURCE, and mudflows. This can be brought on by landslides, a hurricane, earthquakes, or other natural disasters that influence flooding, but while a homeowner may, for example, have windstorm coverage, that coverage may not cover floods as a result of hurricanes. Flood insurance was designed to protect the structure and the contents. Flood insurance covers cleanup expenses, damages to your heating and cooling systems, and repair or replacement of flooring. The two most common reimbursement methods for flood claims are Replacement Cost Value (RCV) and Actual Cash Value (ACV). The RCV is the cost to replace damaged property. It is reimbursable to owners of single-family, primary residences insured to within 80% of the buildings replacement cost. All other buildings and contents are valued at ACV. The ACV is the RCV at the time of loss minus physical depreciation. Personal property is always valued using the ACV. 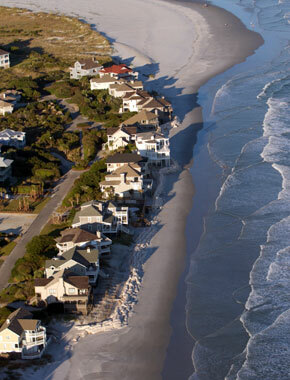 We also offer excess flood coverage over the $250,000 maximum limit provides by FEMA.